Nowadays I could not have enough time for uploading to TN. Today, I post Turkish hamster from Erzurum Province. The photograph was taken in nature during scientific works, when we released it. 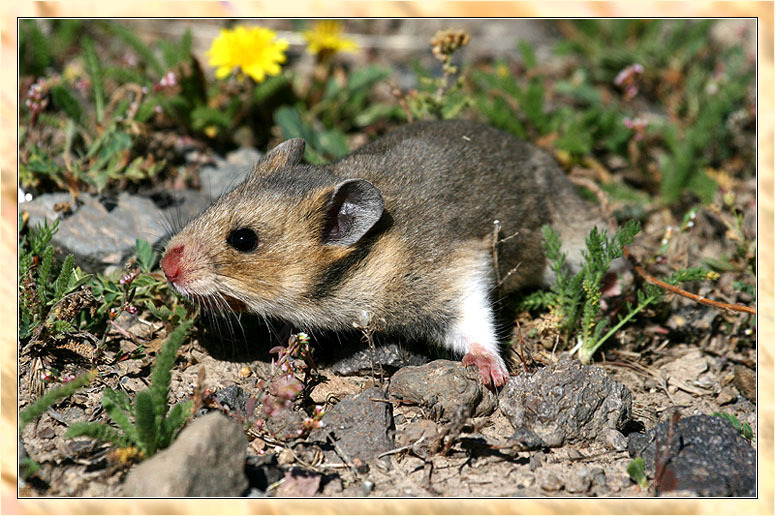 Mesocricetus brandti Nehring, 1898 is one of three hamster species of the subfamily Cricetinae in Turkiye. This is known as "Turkish Hamster". Turkish vernacular name is "Avurtlak" which it was derivated from cheek pocket (avurt in Turkish). Hamsters carry their food from out side to holes, depositing into these pockets. ** Cricetulus migratorius (Pallas, 1773) which I uploaded previously. Both species of the genus Mesocricetus Nehring, 1898 are used as labratory animals all over the world and especially children like them as playful pets. This shot for my good friend Ho Tony (gracious) from New Zealand, with my best wishes. Beautiful capture of this little Hamster Ahmet. Its amazing to see one in its wild environment. I kept them as pets in England, but they are not allowed into New Zealand at all. What a lovely shot of this little hamster. The DOF and POV are both great. Normally, I suppose, this would be a very difficult shot to take. This is a superb capture of a Turkish Hamster with great sharpness, lighting, agood pose and taken from a fine low POV. Nice natural BG too. great shot of this little Hamster! It's great to see a wild one! Great low-down POV and a good DOF. A better composition would have been to position the Hamster on the right side of the frame but this composition still works well. Ahmet tebrikler , hem fotoğraf �ok g�zel , hemde verdiğin bilgiler �ok yararlı , eline sağlık . Lovely capture of this little Turkish Hamster in the wild. Excellent POV and beautiful light. Sharp details and fine colours too. A very clear and sunny picture! It's so good the exposure and details got on the hamster. You've made also a very good composition with the pose and the yellow flower at the back. Kuşlardan memelilere sevimli bir �ye ile d�n�ş yapmışsın Ahmet, saha derinliğini kısıtlayarak hayvanın �n tarafına izleyenleri sevketmen �ok hoş, kutlarım. What a cute animal. fine scenery am amazing reproduction the scene. Bravo. Terrific light, clear fine colourd, razor sharpness of the image and superb DOF. Composition is wonderful too. Bravo and compliments. Well done. Superb composition to let us to enjoy and gain knowledge of the Turkish hamster and real thanks for the wonderful notes! excellent sharpness with perfect exposure and focus on the subject! CONGRATULATIONS. This is your 150th post. And you have posted this cute looking hamster for a very good landscape photographer. Excellent composition and details. Thanks a lot for sharing. Hiiiiii, hacı bu �ok tatlıymış yahu... �pesim geldi keratayı:) eline sağlık. E artık bunlardan TC!de "hi�" olmayan bir "A Field Guide to Small Mammals" yaparsın artık:). This is a very good photo of the Turkish Hamster, Ahmet. Ahmet hocam ger�ekten �ok renkli ve kaliteli bir fotoğraf. Elinize sağlık İnşallah T�rkiye'deki T�m Rodentia t�rlerini fotoğraflarsınız.